If you use conventional cleaning products on your floor, well, think of it as swishing and swashing potentially toxic chemicals across the largest surface area of your home. And then consider the Environmental Protection Agency study showing indoor levels of pollutants (like formaldehyde, chloroform, and styrene) ranging from two to 50 times higher than outdoor levels—much of it from conventional cleaning supplies. Some floor cleaners include a surprisingly toxic ingredient list—people exposed to the heavy-duty cleaners often experience eye irritation, dizziness, loss of concentration, fatigue, wheezing, coughing, asthma attacks, respiratory infections, and hypersensitivity pneumonitis. 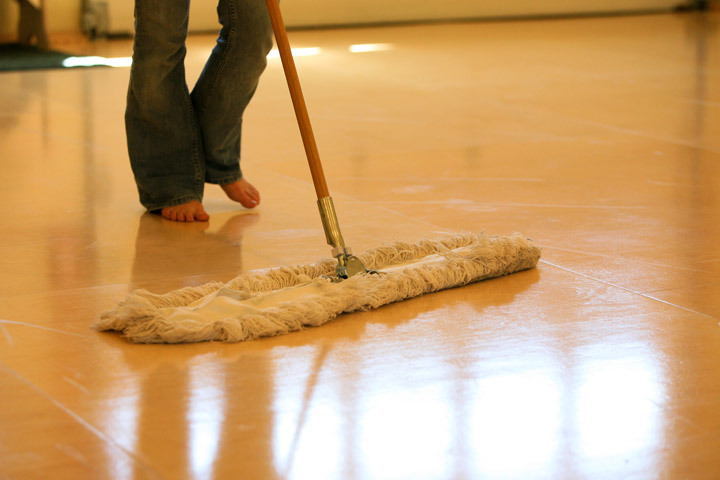 Different flooring surfaces require a specific type of cleaning process. Using the wrong method and formula for your specific flooring material can eventually (or quickly) ruin the floor. For all of the following tips, please test first on an inconspicuous are to determine compatibility with your floor. Floor care for all wood floors is not the same. You need to know if your wood has a surface finish or if it has a penetrating finish. A floor with a surface finish is very shiny and glossy, and is protected by the coating on top of the surface. Surface finishes sit on top of the wood surface, like paint, and include varnish, polyurethane (urethane), acrylic and epoxy. Consider water an enemy to a wood floor. If it soaks in, warping and damage will ensue. Damp mopping is a method whereby the mop is barely wet, you do not want puddles of water on your wood floor. Depending on how much traffic your floor sees or in specific rooms (the kitchen), you may have to mop it as often as once a week—other areas may need it much less. To damp mop, wet the mop and wring as much water out as possible. Go over the floor twice, first to dissolve the dirt and then again, after rinsing the mop and ringing it thoroughly, again to rinse. The floor can then be buffed dry with a towel—this is done easily by attaching a towel to a clamp mop handle. • Don’t use oil soaps, wax cleaners, or products that promise “shine.” They leave build up and create problems when it’s time to put a new surface coat on the floor. • Don’t use vinyl or tile floor care products on wood floors. Acrylic waxes cause wood to become slippery and cloudy—which can only be fixed by sanding and refinishing. • Don’t use ammonia cleaners they will dull the finish and performance of your floor. • Don’t use vinegar. Low pH cleaners (acidic, like vinegar) can dissolve hard water and mineral deposits, but can’t tackle dirt and grime. Many people rely on vinegar, but since it is an acid it will eventually dull the finish. • Don’t use high pH cleaners (more alkaline, like harsher soaps) are good at dissolving dirt and grime. But will also eventually dull the finish. • The best non-toxic floor cleaning solution is ¼ of a cup of mild liquid dishwashing detergent added to a bucket of warm water (for damp mopping). • For scuff marks use a sprinkle of baking soda on a damp sponge and rub. A floor with a penetrating finish will have more of a matte finish and you may be able to feel the grain of the wood—these floors are protected by the oil or wax that has sunk into the wood, like oil. Penetrating finishes include resins or sealers such as Danish oils and penetrating seals, and oil finishes such as linseed oil and tung oil. • (Ever) use a water based cleaner on a penetrating finish floor. • Don’t use cleaners specified for a surface finish, they can turn a penetrating finish cloudy. • Cleaners recommended for a penetrating finish are solvent-based. Use a natural citrus solvent rather than a mineral spirit or turpentine based cleaner. Spray a light film on the floor and dry mop with a microfiber or regular dust mop. • Spills should be wiped up immediately with a lightly water dampened cloth and then hand buffed dry. • To remove white spots caused by water spills, use the finest steel wool and a small amount of natural citrus solvent, rub gently in a circular motion until spot is gone. Then apply a bit of jojoba oil to the area and buff. The top layer of laminate flooring is a hard melamine wear layer over a layer of printed paper—it is very durable and very easy to clean. Basically you should follow manufacturer’s directions, but avoid their cleaning products—you don’t need them. • Don’t use soap-based cleaners or “mop and shine” products—they will make the floor cloudy. • Don’t use abrasive cleaners, steel wool, or scouring powder, which can scratch you floor. • Don’t wax or polish your floor. • Vacuum, use a dust mop or wipe with a damp cloth. • For spills, wipe with a cloth or sponge. These are the softer floors and include vinyl, linoleum, and cork. Linoleum is often confused with vinyl, but they are very different materials. Vinyl is synthetic, while real linoleum is made from natural ingredients (wood flour, rosins, ground limestone, powdered cork, pigments, jute, and linseed oil). • Don’t use solvent-base products, they can soften and damage resilient flooring. • Don’t scour the floor. For tough stains, make a paste of baking powder and gently wipe with a wet rag. • Sweep, dust mop or vacuum frequently. • Damp mop with a mild all natural liquid dish detergent and warm water. • Damp mop with a 1/2 cup of vinegar added to the water to rinse and increase shine. • Remove scuffs by dipping a sponge in jojoba oil and rubbing lightly—then wipe. Smart advice from The Old House Web is to pre-wet a ceramic tile floor before using any cleaners. The water saturates the porous tile and prevents the cleaning agents from penetrating into the tile body. Floor tiles should be always rinsed thoroughly after cleaning. • Don’t use harsh abrasive cleaners that might scratch the glaze. • Don’t use acid-based cleaning solutions because they can damage the complex silicates in a glaze. • Regular maintenance should include sweeping, or preferably dry or damp mopping or vacuuming to reduce grit. • Always start with the gentlest method possible, which may be as simple as warm water. • Damp-mop ceramic tile with a low pH mild detergent. Dry the floor with a soft cloth to avoid streaks.